The Western diet — or the “typical American diet” — is filled with processed grains, added sugar, meat, dairy, and salt. A recent study from the Centers for Disease Control and Prevention (CDC) reported 30% of U.S. adults drink sugar-sweetened beverages such as soda or lemonade each day. The Western diet is contributing to an increasing number of people developing Type 2 diabetes. However, there are other choices, and many people are turning away from processed foods and toward eating plant-based diets and drinking more water. What if you could make a few small changes in your lifestyle that connected your mind and your body to help manage your diabetes? What does it mean to connect your mind and body? How does it work? Using conventional medical treatments and following a healthy lifestyle can help control Type 2 diabetes. But adding integrative medicine systems, holistic practices such as yoga, and supplements to your diet can complement your diabetes treatment, help improve your health, and increase your general sense of well-being. The U.S. medicine system generally works by treating symptoms we feel in our bodies. In the Ayurvedic medicine system, a 3,000-year-old Indian system, people are treated by helping the body and the mind become balanced, as opposed to a list of symptoms to be cured. In Ayurveda, human beings, like the universe, are made up of each of the five elements: air, space, fire, water, and earth. These elements, in their biological form, are known as Doshas: Vata, Pitta, and Kapha. You can take a simple quiz to learn your dosha at https://store.chopra.com/dosha-quiz. Because everyone has all of the elements in their bodies, everyone has each of the doshas as well. Each person is thought to be born with his/her own balance of these doshas. Keeping healthy depends on whether our doshas are balanced or unbalanced. In Ayurveda, diabetes is called Prameha. According to Ayurveda, some causes of diabetes are an unhealthy diet that irritates the Kapha dosha, sitting more than moving, getting too much sleep, and not taking time to manage stress. In the Ayurveda system, there are guidelines for what types of foods help keep the body in balance, depending on your dosha. For example, eat fresh foods in season and eat more soups during the colder months, which is the Vata season, and eat fresh greens and fruits during the summer months, which is the Pitta season. There are six tastes you should try to include in each meal: sweet, sour, salty, bitter, pungent, and astringent. Once you know your dosha, you can eat foods that help keep your dosha in balance. If you are a Vata dosha, you would eat foods that are sweet, sour, or salty. Pittas would eat foods that are sweet, bitter, or astringent; Kaphas would eat foods that are bitter, pungent, or astringent. People with Type 2 diabetes have imbalances in their Kapha dosha. To balance the Kapha dosha, meals that are plant-based with lots of spices will satisfy your hunger and help maintain your blood sugar levels. Ayurvedic practitioner Sheila Patel, MD, uses an integrative approach to treating diabetes. She practices integrative medicine as medical director of the Chopra Center in Carlsbad, California, which was founded in 1996 by Deepak Chopra, MD, and David Simon, MD. “Bookend your day with deep breaths, try five minutes of deep breathing in the morning to center yourself for the day and try five minutes of deep breaths at night to destress and relax into sleep,” she said. “Be sure to eat more of your calories during lunch rather than dinner, as digestion is strongest in the middle of the day.” Studies have shown that people are able to maintain a healthier weight, important in diabetes, if they consume their largest meal of the day before 3 PM. Patel said Ayurveda can help you make small shifts in thinking, eating, and physical activity levels that can help you manage Type 2 diabetes. In addition to deep breathing in the morning and evening, little shifts in your thinking and diet can help. For example, be mindful of why you are reaching for that sugary drink. Is it out of habit? Is it because you are thirsty? Added sugar is associated with obesity, Type 2 diabetes, and heart disease. If it is a habit, take a few deep breaths and do something different, such as swapping the sugary drink for ginger tea. If the reason is thirst, drink water, preferably warm, since warmth helps correct the imbalances of the Kapha dosha. “An Ayurvedic diet is similar to the low-glycemic diet for people with diabetes, which includes limiting foods high in sugar and simple carbohydrates; eating smaller portions throughout the day; eating a variety of whole-grain foods, complex carbohydrates, and vegetables every day; eating fewer unhealthy fats and oils; and using less salt,” said Patel. “Vegetables should cover one half of your plate with Kapha-balancing foods such as lentils, chickpeas, spinach, and leafy greens. And use fragrant spices such as cinnamon, ginger, and turmeric.” These spices are being studied by the National Institutes of Health Center for Alternative Medicine (CAM) to learn if they are effective for helping keep blood sugar levels manageable and for the anti-inflammatory properties that help reduce stress, and are part of the Ayurvedic diet. The Ayurvedic system also includes practicing yoga, which is helpful in controlling blood sugar. Yoga improves blood circulation in your body, particularly in the arms and legs, where people with diabetes need careful monitoring. 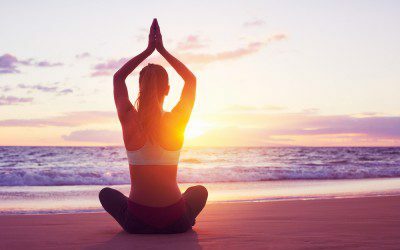 A recent study published in the Journal of Diabetes Research shows practicing yoga may benefit adults with Type 2 diabetes. The researchers reviewed 33 studies and learned that yoga may help improve glycemic control, lipid levels, and body composition. Some studies showed connecting movement with breath also may lower oxidative stress and blood pressure; enhance pulmonary and autonomic function, mood, sleep, and quality of life; and reduce medication use in adults with Type 2 diabetes. A regular yoga practice can help reduce the level of sugar in the blood and lower blood pressure. It also can help regulate weight, which is key to Type 2 diabetes management. Also, stress increases the secretion of glucagon, a hormone responsible for increasing blood glucose levels in the body. When you practice yoga, deep breathing, and meditation, you become calmer, which helps to manage your stress. This lessens the secretion of glucagon, thus helping to keep your blood glucose levels stable. When you connect healthy eating with breathing and movement, you integrate the body and mind to bring a sense of stability and balance to the whole person. According to the National Institutes of Health National Center for Complementary and Integrative Health (NCCIH), “overall, there is not enough scientific evidence to show that any dietary supplement can help manage or prevent Type 2 diabetes.” And CAM says you should be very careful when using dietary supplements because there could be a link to kidney disease. This link is important, because diabetes is the leading cause of kidney disease and kidney failure. Here is a closer look at a few of the supplements studied for diabetes management. Alpha-Lipoic Acid (ALA). This is an artificial version of lipoic acid, a naturally occurring compound made in the body and by plants. It is an antioxidant that helps stop the damage caused by free radicals. In 2011, a clinical trial of 467 participants with Type 2 diabetes found supplements of 600 milligrams of alpha-lipoic acid daily did not prevent diabetic macular edema, an eye condition that blurs vision. Another study showed alpha-lipoic acid did not affect the body’s response to insulin in people with Type 2 diabetes. There is a safety concern to be aware of as well: High doses of alpha-lipoic acid supplements can cause stomach problems. Chromium. Chromium is found in nearly every food group. The top sources are broccoli, barley, oats, green beans, tomatoes, romaine lettuce, and black pepper. However, the amount of chromium in foods is small — one to two micrograms or less. Researchers are not sure what level of chromium we need. In 2001, the U.S. dietary guidelines for daily chromium were lowered from 50 to 200 µg for an adult to 35 µg for an adult male and 25 µg for an adult female. Recently, the European Food Safety Authority removed chromium from the list of nutrients and essential elements because a study showed the intake of chromium (III) has no beneficial effect on healthy people. What is the link to diabetes? Chromium is an essential trace mineral. If you have too little chromium in your diet, your body can’t use glucose efficiently. However, studies have found no benefits of chromium supplements for controlling diabetes or reducing the risk of developing it. What research has shown, though, is that chromium supplements in large doses may cause kidney damage, muscular problems, and stomach problems. Herbal supplements. Although the Ayurveda system encourages the use of spices and herbs to help maintain a healthy body, there is limited evidence showing herbal supplements can help control diabetes or its complications. However, herbs and spices in general can make plant-based foods and grains more palatable and help you feel more satisfied, which helps people with Type 2 diabetes stick to a healthier diet. Numerous studies of cinnamon have been conducted to learn if it can help control glucose levels in Type 2 diabetes. But research has shown there are more risks than benefits to including cinnamon as a supplement in your diet. European researchers tested samples of a common cinnamon found at grocery stores and learned that it contained coumarin, a sweet-smelling compound that can act as an anticoagulant. Eating coumarin can worsen liver disease. It also is very risky for people who are taking blood thinners, since the interaction of coumarin and blood thinners can increase the likelihood of bleeding. A word of caution about dietary supplements: The U.S. Food and Drug Administration (FDA) is working to remove from the market illegal dietary supplements that claim to manage, cure, or prevent diabetes. It has sent 15 companies warnings that their products violate federal law. The FDA is advising people to seek proper care for diabetes and to consult with a doctor before taking any dietary supplements. FDA Commissioner Margaret A. Hamburg, MD, has said that consumers who buy those products that claim to be treatments are putting themselves at risk and possibly are not seeking necessary medical attention, which could affect their diabetes management. • If you have diabetes and are thinking about using a dietary supplement, visit NCCIH’s web page. • To learn more about dietary supplements, watch this video produced by the FDA: Diabetes Products — Don’t Fall for False Promises. JoAnn Stevelos, MS MPH, is a public health professional and health writer. She is director of research and evaluation for the Alliance for a Healthier Generation Healthy Schools Program. This article does not necessarily reflect the views of the Alliance for a Healthier Generation.